Efficient energy transport in photovoltaic carbon nanomaterials. (Phys.org)—A LANL team and collaborators have made advances in the understanding of how carbon nanotubes move charges created by light. The research has applications for cheap, all-carbon-based photovoltaics and light detection elements. Their work measures exciton transport (excitons are small packets of energy made up of positive and negative charges) in carbon nanotubes at room temperature in a colloidal environment. A colloid is a substance that is evenly distributed throughout another substance, generally with particles that are between 1 and 1,000 nanometers in size. The nature of the colloidal environment influences the transport of charge-neutral excitons along the backbone of a carbon nanotube. 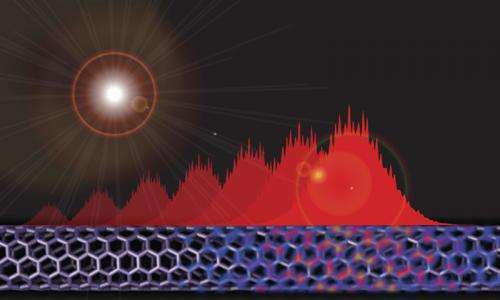 The exciton transport is described as "disorder-limited," which means that the movement of the exciton packet is restricted because of the nature of the environment attached to the nanotube surface. Excitons can only go backwards and forwards because they are confined to the tube surface, similar to a ship traveling down a narrow river that cannot turn around but can only go in forward or reverse. In this system, the excitons travel a few nanometers in each direction before reversing. The research team found that the nature of the interface between the tube and the environment around it strongly affects the efficiency of this back and forth transport. By controlling the colloidal environment for certain factors (some colloidal substances may enhance transport), they propose that excitons can travel over a factor of five farther than they would otherwise. In their experiments, excitons traveled in carbon nanotubes exceeding that of any other known material, and they did so at room temperature. Understanding what factors govern exciton flow is important for photovoltaic applications where neutral excitations produced by sunlight must move to an interface where they can separate into positive and negative charges. This separation creates a voltage that could charge a battery. It also yields insight into how to create effective light-gathering materials. Nano Letters published this research.